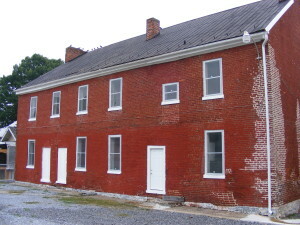 In 2010 the Washington County Historical Trust nominated the historic Hagerstown Alms House to Preservation Maryland’s 10 most endangered properties. As a result of the nomination, the City Hagerstown “mothballed” the building to protect it from further deterioration. Hagerstown also designated this rare surviving almshouse as a historic landmark. This great old building is still looking for a job. . . . In colonial Maryland each county cared for its own poor; but no almshouses or workhouses were built until 1768 when an act of Assembly made provision for such houses in five counties. The Washington County Almshouse is a rare surviving example of a almshouse dating to the turn of the nineteenth century. According to the site survey, this Almshouse “may be the earliest extant purpose-built almshouse in the state.” Five trustees in a corporation purchased the land, built and furnished the house, then appoint an overseer. 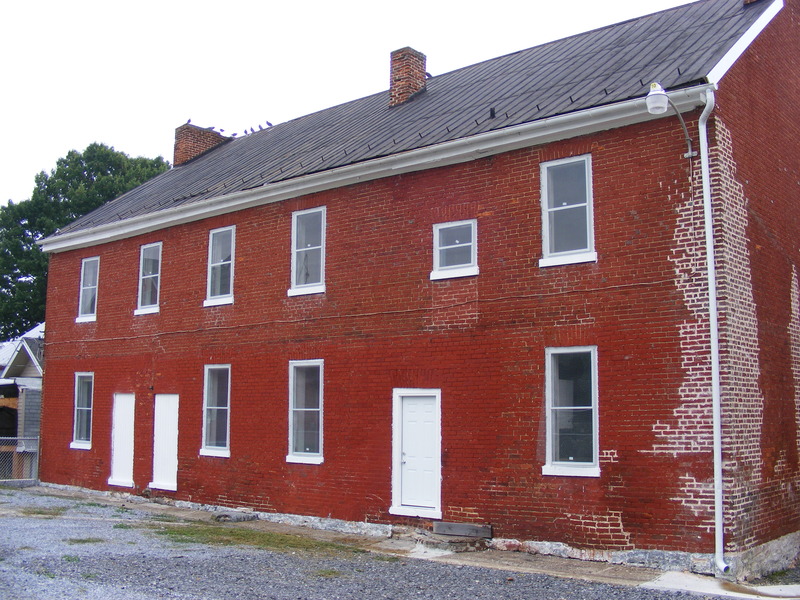 Bids for a brick ‘poorhouse’ were advertised March 28, 1799 in the Maryland Herald and Elizabeth-Town Advertiser. Life at the Almshouse was hard, the trustees compelled the poor to work. Over the years the almshouse was underfunded and overcrowded, charged with taking in “any rogues, vagrants, vagabonds, beggars and other idle dissolute and disorderly persons,” including the mentally ill. By 1880, this structure was no longer used as the Almshouse, having been was replaced by Bellevue Asylum, north of Hagerstown. The original Alms House also has significant association with the Civil War. From 1870 to 1875, soldiers that were been buried on the Alms House property were exhumed and sent to more appropriate grounds and applicable surroundings. For more than another hundred years, the sturdy Alms House building continued to be used, recycled again and again, both as residences and for business, its 36’ by 60’ footprint providing 6,480 square feet of habitable space on three floors with still more in the attic above. City staff reported two suggestions to the city council. The first was to renovate as lofts or townhouses, however staff thought “the layout of the building does to lend itself to this use.” The second idea was a neighborhood parking lot. Staff estimated demolition and construction would range around $125,000. These free parking spaces would generate neither income, nor tax revenue, and would require the continuing costs of both maintenance and policing. 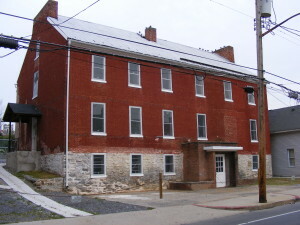 In 2006, the State of Maryland awarded the City an $ 85,000 Community Legacy grant to locate a developer who would renovate the building for adaptive re-use. It was anticipated that the City would donate the building to the developer, plus provide $160,000 of grant funds towards the project. But the additional grant funding never materialized, and developers quickly withdrew their offers while the City waffled on the idea of donating property to a developer. The City has received several extensions on this project deadlines. The State of Maryland wants to recapture this grant award if the City does not intend to undertake the adaptive re-use project in the very near future. City staff expressed concern that future Community Legacy Grant funding approval may be affected by this outstanding grant. The almshouse stands empty. For the last several years, the minutes of City Council meetings reflect the numerous times concerned citizens, historians, and preservationist have approached City council with additional suggestions, offers, and historical documentation. Unquestionably, the community is looking to their elected leader for a success story in historic preservation. The almshouse would make an elegant residence. The almshouse would make upscale townhouses. The almshouse would make superb offices. There is structure, history, and off-street parking. Recent arguments preventing rehabilitation plans include the present state of the economy and a disruption of alternate state or federal funding resources. So, when is a good time for action on historic preservation? The answer is now – contractors need projects, the City needs revenue. This article by Patricia Schooley appeared in the Herald-Mail Newspaper (Hagerstown, MD), the 155th in her series of articles about the architectural treasures of Washington County, Maryland. It’s one of the largest buildings along North Locust Street, built into a rise on the west, set a bit back from the sidewalk, and three stories tall, with a massive stone foundation protecting the ground level. The upper two-and-a-half stories are built of brick laid in Flemish bond on the east and south facades and five-to-one bond on the north and west. The Almshouse has long been neglected, standing empty for almost ten years. The roof is metal and still in good condition. Some windows still have original six-over-six or nine-over-nine sashes; others are replacements or are missing glass, admitting pigeons. A graceless modern vestibule has been added to the main entrance in the third bay from the north on the lowest level, the cellar that opens at street level on the east. This vestibule hides the original arched doorway. Two large rooms fill this level, with a large stone service fireplace in the south wall. Several types of fireplaces are found on the two stories above. One has a large firebox with a curved brick lintel; another has a smaller rectangular firebox set to one side of its masonry face. Some fireboxes have been closed; but only one is missing its mantel. The upper two floors have four rooms arranged on either side of a central hall that runs the length of the building. Two of these rooms still have original 18th century raised-panel doors. 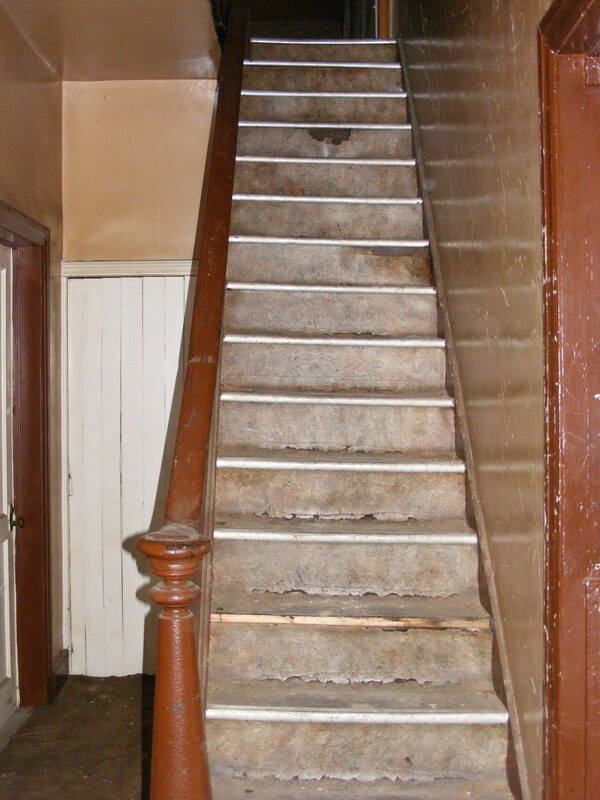 Stairs rise to the attic from the basement-level entrance. 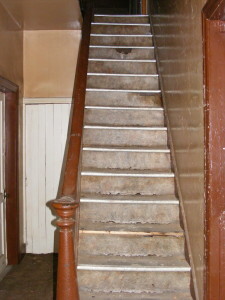 Floors are solid and appear to have been replaced at some time with narrow-board flooring. Walls are plaster, and some original chair rail remains. 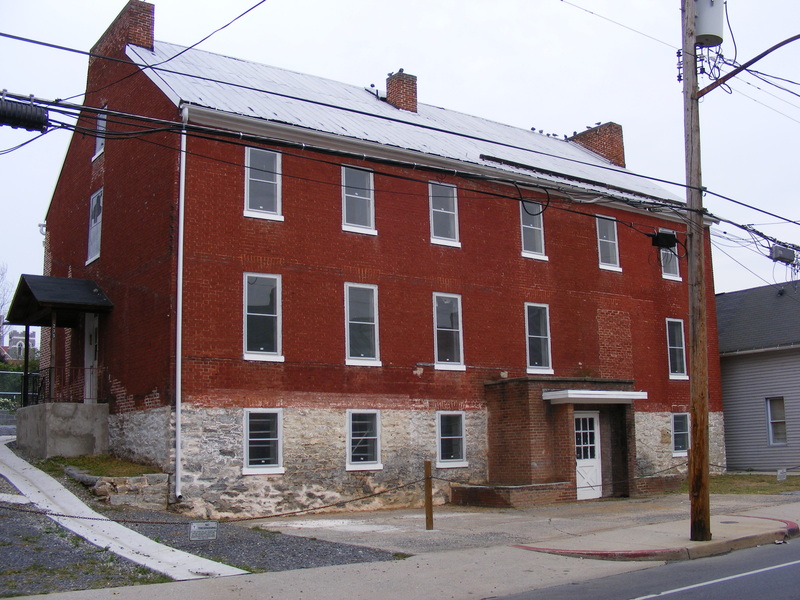 Aware of an upcoming auction of this property and feeling that this building was crucial to the redevelopment of Locust Street, City of Hagerstown staff members approached the City Council about purchasing the property to control its use and to preserve the building. Council approved the plan and established an upper bid limit. On September 28, 2004, L. E. Bayer, a manager for the city, bid $90,000 as the property was auctioned from the steps of the County Court House. 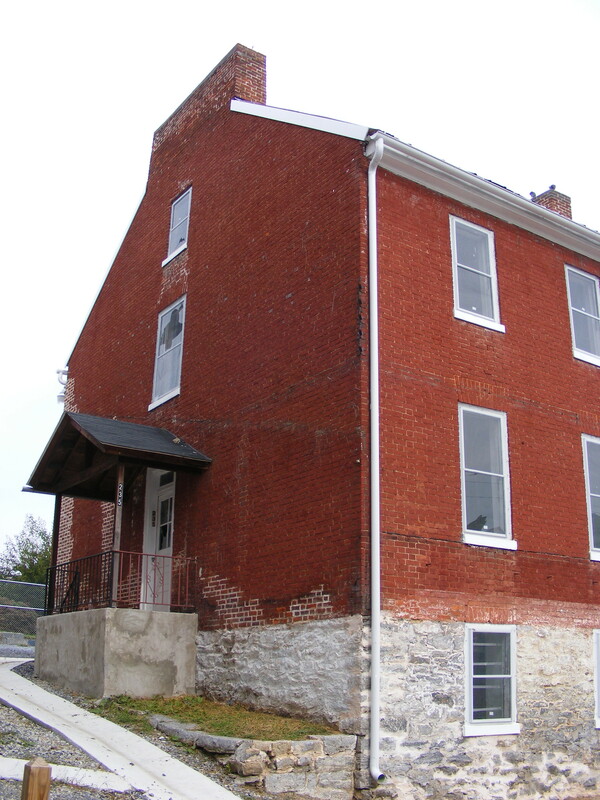 On October 12, 2004, the City Council of Hagerstown passed an Emergency Ordinance that authorized the purchase of “an improved lot located at 239 N. Locust Street” and appropriated the funds for the purchase from the previous year’s Capital Improvement Program (CIP) budget. A February 24th, 2005, Memorandum from Mr. Bayer to City Administrator Bruce Zimmerman was discussed at the March 3rd meeting of the Council. The memorandum stated that Staff had considered two options for the property. The only explanation of the first option stated: “One would be to renovate the main structure for housing as either lofts or townhouses. However, the layout of the building does not lend itself to this use.” No further justification of this statement was offered during discussion. The second option created neighborhood parking. A schematic presented 14 parking spaces after demolition of the Almshouse and the two accessory buildings behind it. “The cost of construction, including demolition, will range from $100,000 to $125,000.” The staff asked for guidance from the council on which direction to proceed. Council member Nigh said she is not in favor of tearing down more buildings and creating parking lots. Council member Aleshire said he thought the plan was to get the property back on the tax rolls and asked for a cost benefit analysis. The Survey form chronicles some of the difficulties that occurred in running the almshouse over the years. The house was under funded and overcrowded, charged with taking in “any rogues, vagrants, vagabonds, beggars and other idle dissolute and disorderly persons,” including the mentally ill. The city’s growth, which brought the downtown close to the facility, created yet another problem. The fathers saw that having the destitute and insane on public view near the center of their city made it less attractive to all who came there. Studies were made, and moving the almshouse to a farm was recommended several times. Eventually, John Nicodemus, tired of delays, gave a farm north of Hagerstown to the city for that purpose. By 1880, the Almshouse had been replaced by Bellevue Asylum, which was later torn down to build the Western Maryland Hospital Center. For more than another hundred years, the sturdy Almshouse building continued to be used, recycled again and again, both as residences and for business, its 36’ by 60’ footprint providing 6,480 square feet of habitable space on three floors with still more in the attic above. It “may be the earliest extant purpose-built almshouse in the state,” states the Site Survey report. This historic building, probably unique in the state, is now threatened with demolition. The proposed fourteen parking spaces suggested by City staff would cost the City of Hagerstown taxpayers between $13,500 and $14,000 apiece. These free parking spaces would generate neither income nor tax revenue, but would require the continuing costs of both maintenance and policing. If the city were to offer this structure to private developers with easements that require it to be restored, that developer could take advantage of the federal, state and local tax credits, all of which piggyback on one another. Federal tax credits of 20% and state tax credits of 20% give the developer 40% of the value of approved restoration (that would be everything except landscaping in this case), returned to him either as credits on his taxes or as a commodity that he may sell or trade to another party. In addition, the county offers a 10% credit for all approved exterior restoration of an historic building and a 5% credit of the cost of new construction attached to a historic property. Should the developer decide to add on in the rear of the structure to accommodate new kitchens and baths without disturbing the original fabric of the building, this credit could be used. These combined credits come to almost half the cost of rehabilitation, making the rigors of restoration fiscally possible for a private individual. This would return the almshouse to the tax rolls, generating income for the city for the future. It would add to either the commercial or residential stock available in the city, and it would preserve a unique part of the city and the state’s history. Flemish bond: brickwork in which headers and stretchers alternate in each course and center over the opposite member in the row below. Lintel: a horizontal structural member that supports the load over an opening such as a window or a door. The beam or arch spans the opening and rests in the wall on either side. Joiner: an early term for carpenter, particularly a cabinetmaker.